It's that time of the year again where I start putting together the family photobook. I started the family photo book tradition after the twins were born and it's always a joy to go through the books and revisit the memories. But, (and this is a little but) I find some of the earlier photobooks I put together a little boring. E.g, with the first photobook, I didn't even know that I could caption the photos or crop them. I've come a long way since then and THIS photobook is going to be the best yet because now I have actual ideas of things to include in the book to make it less boring. It's that time of the year where I start waxing philosophically about how time flies, my girls have grown and yes, what to buy them for their upcoming November birthdays. Do you remember last year's birthday list? (The post is right here). I ended up buying the girls cameras and tablets after all and this year, I've had a revelation. I'll pause this blog post to say "Johanna, you were right!" Keep: This is the art that I want to keep for years. There has to be something very special about it. I organize this art similar to how I organize the girls' paperwork. Each girl has a 4 inch binder with 50 plastic sheet protectors in it. By my calculations, that's 2-4 special art pieces per school year. So far they each have 3 pieces in there including a foot-print art (so they can look back and see how tiny their feet used to be) and first drawing of the whole family. First family portrait showing daddy, mommy, the twins and some random kids I don't know! Display: This is the nice art that gets to be displayed for a while before it's "retired". It includes mother's day gifts displayed on the TV stand and the art I display on the kitchen wall. I remove them when I have another nice piece to replace them with. The kitchen wall display is space limited to maximum 4 pieces per kid. 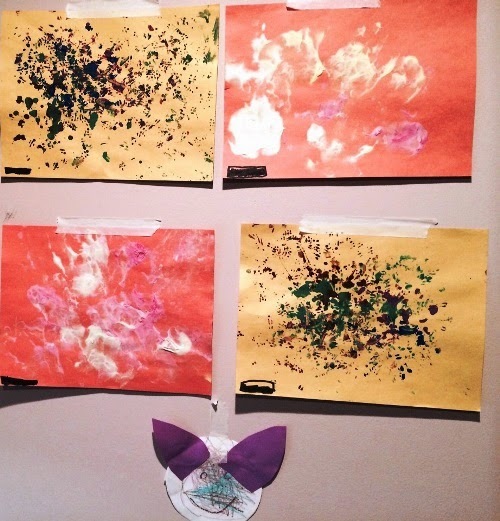 The girls love seeing their art displayed in this form. 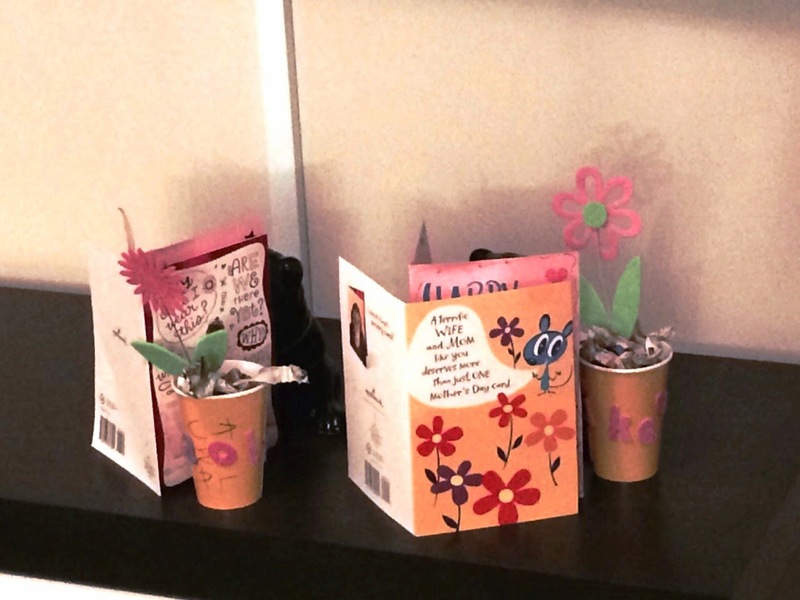 I must confess that all the Mothers' Day crafts I get from the girls fall into this category and none have been taken down yet because I'm emotionally attached to those and I may end up having a mommy memory box for these when they become too many to display! Retire: This is the art work that gets retired into the recycling box that's euphemism for trashed! A lot of pieces go into immediate retirement. 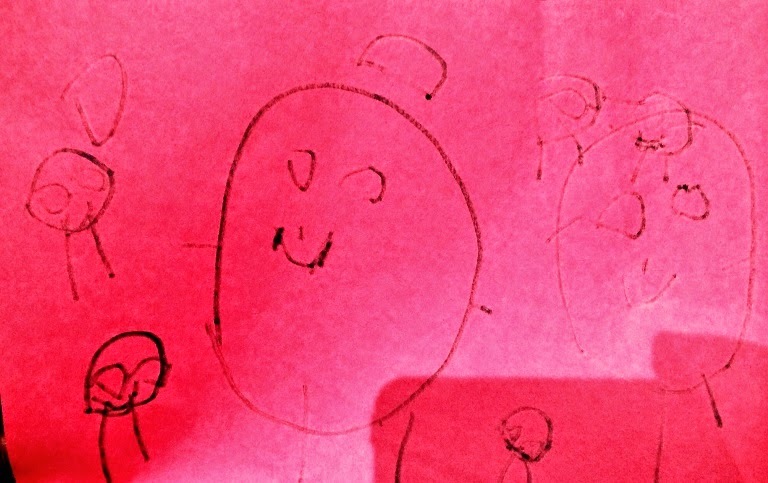 What's your approach to kids' artwork. Do you attach a sentimental value to them and keep everything or do you keep some and lose some? 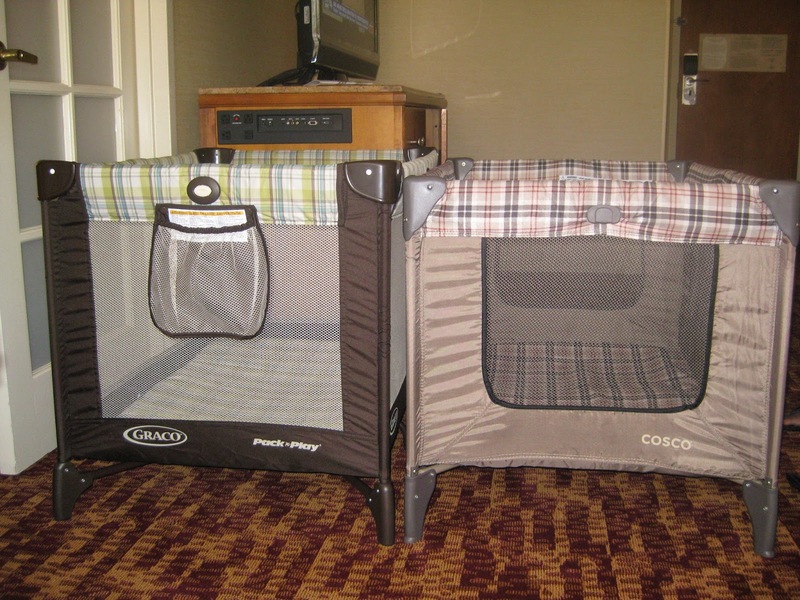 When it comes to vacations, hotel accommodation is always a big ticket item if not staying with family. When you have 2 or more kids to consider, things become extra tricky. 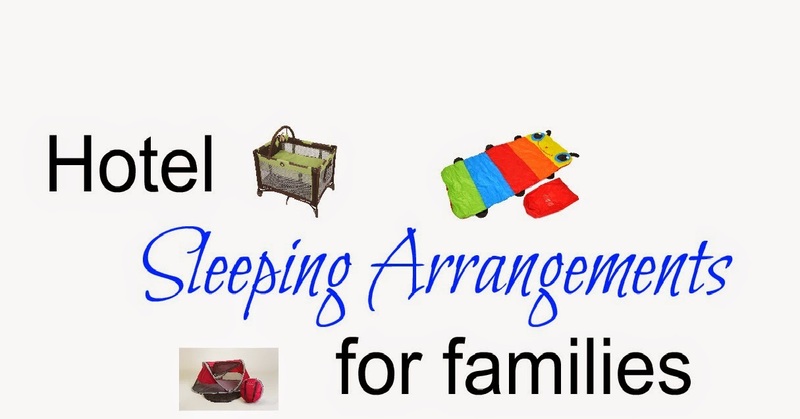 My objective has always been to find a comfortable sleeping arrangement for our family of 4 without breaking the bank. 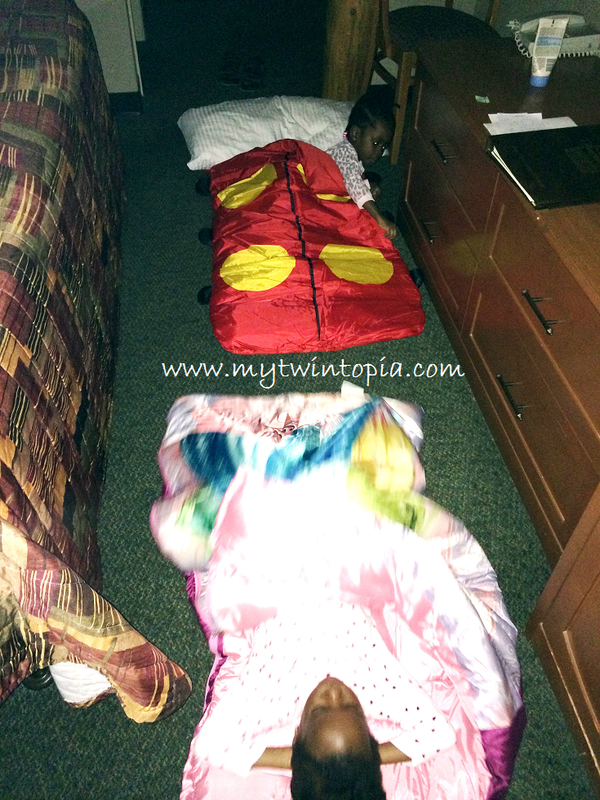 I've tried a few options in the past and during our recent vacation, I experimented with a few additional sleeping arrangements. Here's a list of the pros and cons for each arrangement based on my experience of 2 adults and twins. Best for: Crawling to toddler stage. (8 months to 2 years). We stopped using these when the girls were able to flip themselves upside-down while in the peapod for the sheer fun of it. So I was chatting with my sister a couple of weeks back about some online purchases she made and I commented that "You must have saved quite a bit with your ebates account". To which she replied "What's ebates?" And this Public Service Announcement post was born. 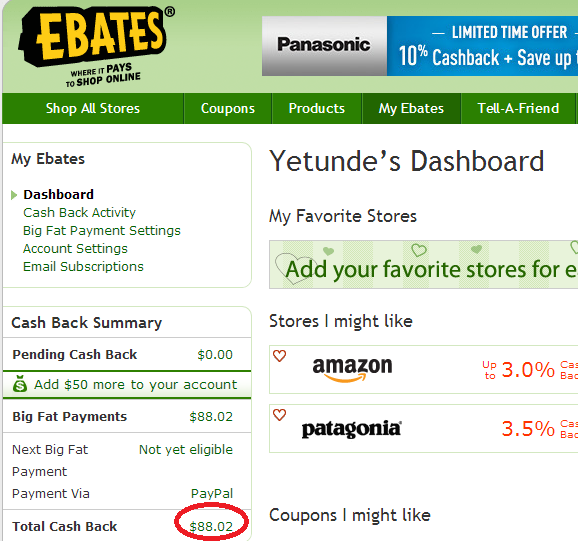 What is ebates? 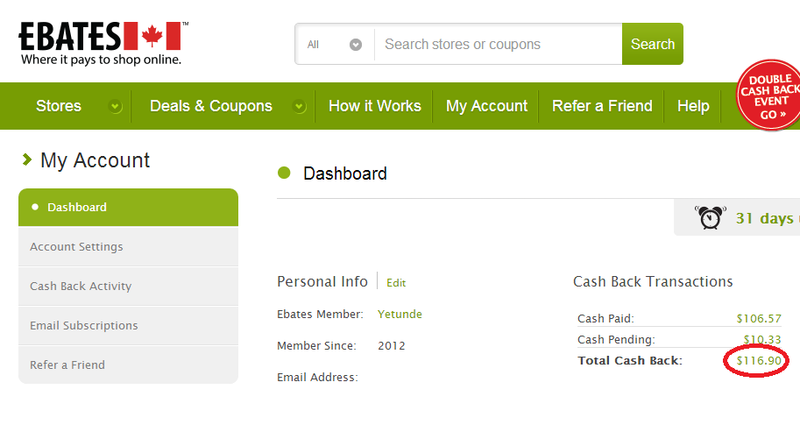 : Ebates is a website that gives you cashback for shopping certain websites online. How does it work? : You open an account (there's a USA ebates and a Canadian ebates and I have accounts in both). Once your account is opened, you click the website you want to shop on from the ebates website and once your transaction is complete, your cashback is posted into your account. The cashback amount is paid out every quarter through various forms. In the past, I've had a check mailed to my home, got an Amazon.com credit and got my Paypal account credited. My favorite option is to have my Paypal account credited as that's how I pay for the girls' netflix subscription. I love online shopping so this really works for me. To date, I've got over $200 back for buying the same things I would buy anyway. Bonus: They always have a double cashback promotion for current events so right now the double cashback category is full of stores that sell school supplies and vacation themed online retailers. Look out for: Black Friday double cashback event. It's super! I've seen stores give up to 20% cash back. How much did ebates pay me for this enthusiastic post? : Nada! I'm just another happy customer who wants to share BUT if you sign up using the links in this post, I get a Tell-A-Friend bonus paid into my account....you know, for the Netflix ;). At least TV isn't melting their brains! Before I had kids aka the time when I was the smartest mom ever, my best friend used to fondly refer to the TV as "electronic babysitter". And I would barely restrain myself from giving her a speech on spending quality time with your kids and doing away with electronics and bla bla bla. Fast-forward to 5 years later. I have procreated 2 little beings. They love me and demand my utter devotion and attention. Devotion, I can give them in bucket-loads. The attention part? Well I try but let's be honest there have been times when the TV has saved me. TV and some guilt. I always question if the girls are watching too much TV and if it's doing them any good because I grew up watching Sesame Street and I can't for the life of me think of anything of import that I learnt from Sesame Street. I had just bought the girls some magnetic letters and numbers for their easel. 2 minutes into putting the numbers up, Spice came to complain to me that the "question" is not staying put. I was a little incredulous so I went to see and sure enough, there was a question mark magnet that wouldn't stick. I looked at her in wonder and asked "who told you that's called a question mark?" She replied rather arrogantly I might add "Super Why"
Me: So how did you learn uno, dos, tres? Well, I consider myself stunned speechless and feeling a little less guilty. Whatever else the TV is doing, at least it's not melting their brains. Truth is some of my fears are natural to me and some of my fears are "inherited". Try as I might, I can't get myself to like cats (sorry cat-lovers reading this!) and I know that is not based on anything more rational than the fact that my dad is leery of cats. Not so my girls. They love cats and dogs and snakes and glass elevators and climbing really high on the jungle gym. In a den of animals pretending I'm not scared of being pecked by that wild duck! 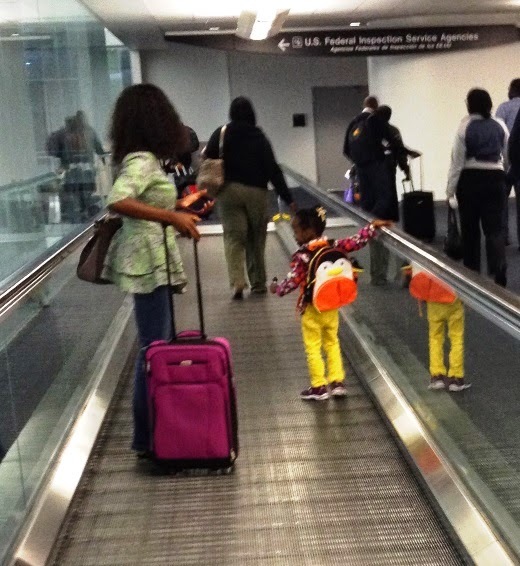 Twin Parenting Lesson 6: Because I can't afford to let them assimilate my fears. I'm brave because they are so much braver. What about you? What rational or irrational fears do you hide bravely? Set Goals: If there's one attribute that makes me standout, it's my hair. I'm always cutting, styling and dyeing it and sometimes that is not a good thing. So now I'm learning to set hair goals not just for myself but also for the girls. My goal for their hair is length and health - healthy shoulder-length before they go into kindergarten September 2015. Why? Because lets be honest, hair is one of the image struggles black females have and kindergarten is just about the time when little girls of African descent start noticing the differences between their hair and Caucasian hair. I know at that age, all I wanted to do was "whip my hair" and my girls are beginning to have the same feelings and requesting for their hair to "shake". If I can take care of their hair so they have good length, then the pressure to get a perm is removed. I change the styles every 1-2 weeks depending on neatness. Shampoos are every other week. I wish I could buy a shampoo bowl but there's no where to store it when not in use. One change I'm also implementing is shampooing with the style in to prevent major tangling issues. I try to stick to simple styles and leave the intricate ones for special occassions. I learnt a lot from blogs and youtube and my skills are definitely better today than 2 years ago. 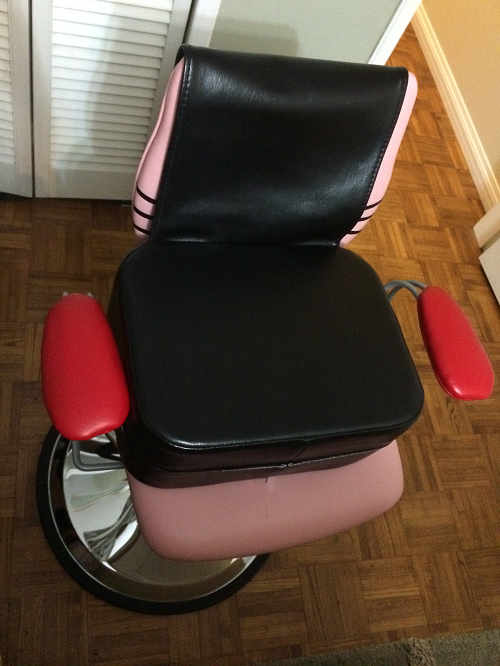 I was able to buy a kid's styling chair on kijiji so I can stand upright while making their hair. My back sent me a thank you note the other day! All styling is done in front of the TV. A collection of hand towels that are reserved for hair only. 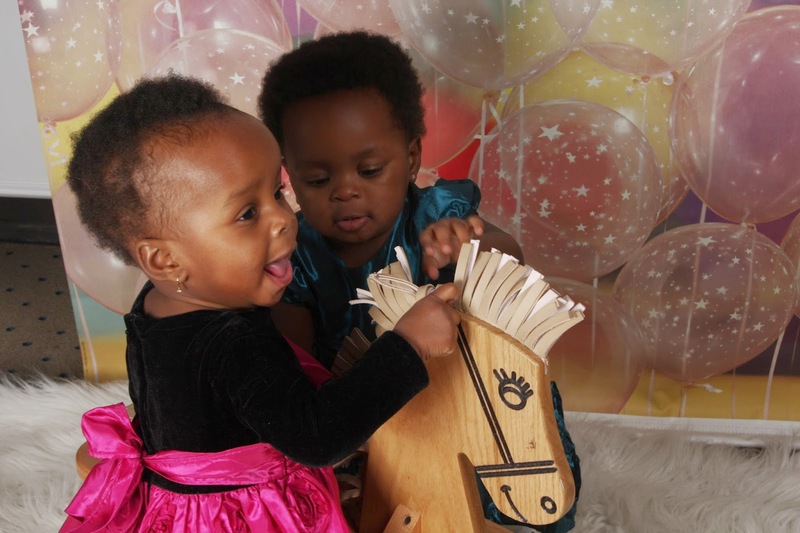 When I recall that on their first birthday the girls had teeny-weeny afros, I appreciate how far we've come and really love the hair journey we're sharing as a family. PS: In case you're wondering about MY hairstyle, I've gone from dreadlocks to afro to texturized afro to red afro to mohawk to very short afro to very short afro with red highlights THIS year alone! Yes, I need that vision board. I blame my hair shenanigans on midlife crisis. What's the most adventurous thing you've done with your hair lately? This is my optimistic post on the nail-biting finale at our house. And by nails I mean fingernails and toenails! It was over a year ago when I noticed that Sugar almost took out my eyeball with an itsy-bitsy fingernail. I quickly trimmed her nail and turned round to do Spice's. I was pleasantly relieved to see that her nails were still short and thought nothing of it. That is until I walked into her room one night and found her chomping furiously on her nails. Ah ha! So that's where all the fingernails went. I bought one of those nasty tasting polish things and applied to her nails, hoping to nip the habit in the bud. She kept chomping but now was also gagging on the taste of the polish. I panicked about her choking and never used the polish again. Until last month! Spice told me she had an "owie" on her foot and when I bent down to take a look I was appalled by the fact that she had almost no more toenails. Her fingernails were bitten to the cuticles and the toenails were not faring any better. To make matters worse, Sugar was ALSO now biting her fingernails. It was time for action. I bought some chewelry (chewable jewelry) last year for the Spice to distract her from chewing on her nails. She liked to wear it, but never chewed on it. I showed Spice my fingernails and told her they were pretty and hers were ugly because she was biting on them. She cried and I felt really bad at my choice of words. So much for saying I want to foster positive body image in my girls and then turning round and telling them a body part was ugly. I really messed up on that one. Thank God for the multiple opportunities for do-overs in parenting. Instead of emphasizing a negative, I tried to put a positive spin on the situation. I got a pedicure just before our trip to Nigeria and Spice was really entranced with my painted toes. I made her a promise that if she stopped biting her nails, I'd paint them pink. She bought it! They both did. This is the longest her nails have been in 2 years! If you had asked me 5 years ago, I'd have told you my kids' nails would not see polish until they were done with high school. I was such a confident mother before I actually had kids! "The market has more than one entry"
That's my literal translation of a yoruba proverb (ono kan o w'oja) which just means there's more than one way of achieving a goal or getting somewhere. It's one of those sayings that's had moments in my life when it was my mantra. 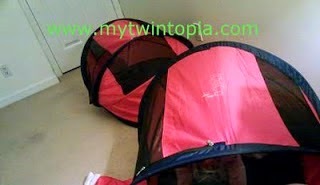 Yesterday, I had THAT moment again when it came to my twins, how they learn and their approach to tasks. It actually started a few months back when I was trying to teach them to count objects on the pages of a counting book. Sugar quickly grasped the concept and could count along the line of objects but Spice struggled. She would skip objects and jump lines and I knew a moment of hyperventilating-panic. Girl's got a 4 of engineers and a maths teacher in her direct genealogy and she can't count a line of 6 fish??? This mama had to work hard not to panic. I reminded myself that she's still young and there's plenty of time to learn to count and that was it. The next day as we drove by a construction site, she yelled "look mama, there's three diggers". I absentmindedly nodded in agreement before I felt a jolt of awareness. MY BABY CAN COUNT! She just is not interested in counting stuff on the pages of books but she can count just fine. Mama learnt her lesson and that was a good thing because whenever it was time to practice writing letters in our "homeschool", Sugar quickly learnt most of her letters and enjoys writing whenever she can get her hand on pencil and paper, chalk and board, crayon and walls... you get it. But Spice would pick up a pencil, look me dead in the eye and declare "I'm tired. I can't do it", and that was that She refused to write her letters and I didn't force the issue. That brings me to yesterday. We got home and both girls asked for TV time. I suggested we write some letters before TV and handed them their books and pencils while I cooked dinner. When I turned around, Spice and turned to the last page of the book and done this! 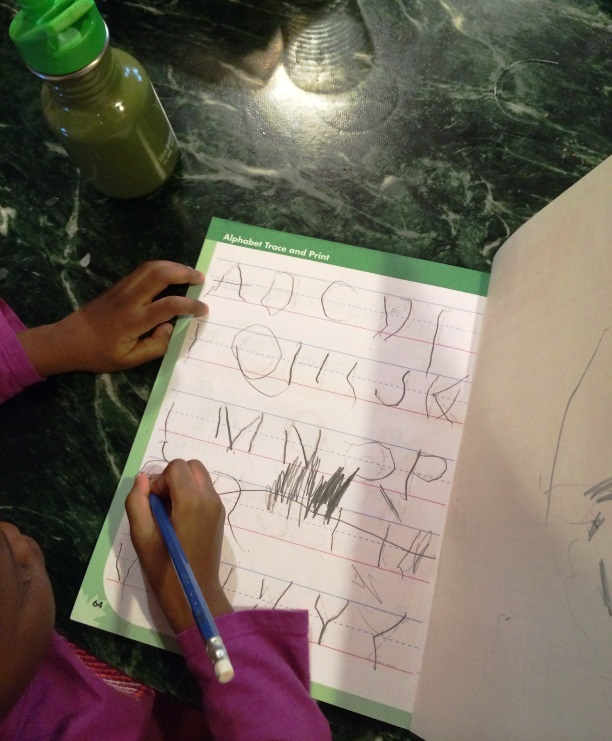 Ladies and gentle people, MY BABY CAN WRITE HER LETTERS! She's just not interested in writing them unless there's an important reason like watching Diego and Dora perpetuate world peace. 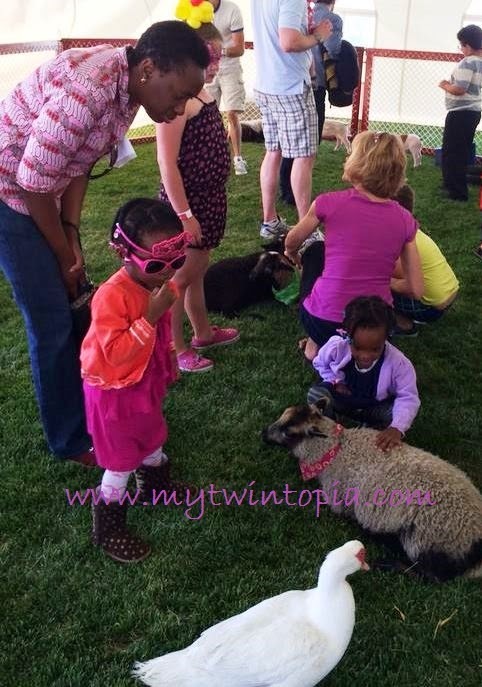 Twin Parenting Lesson 1: The market has more than one entry and kids have more than one learning style. 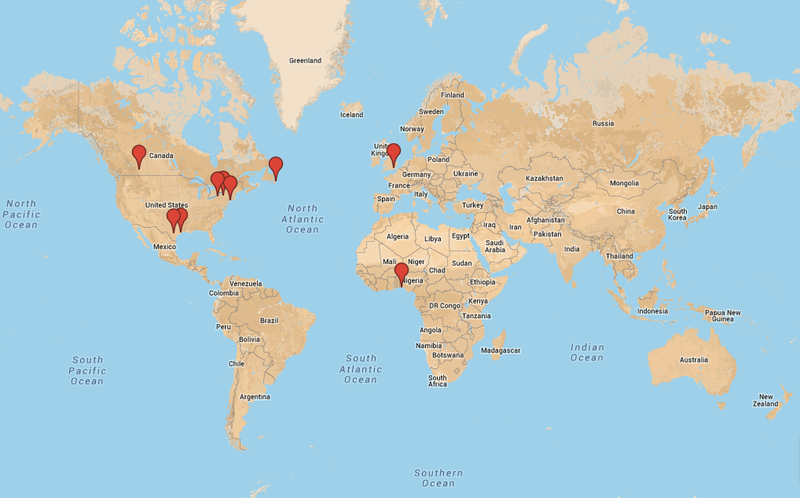 No matter where we decide to plant the roots of our family - Lagos, Houston or Calgary - you'll always stand out because of who you are, your background and your personal story. Standing out is not a bad thing. Don't try to blend in to be more accepted. 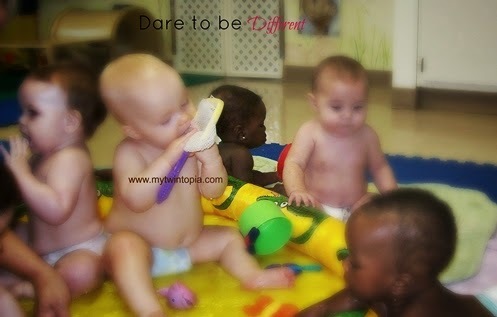 Dare to standout and be different; because you already are. 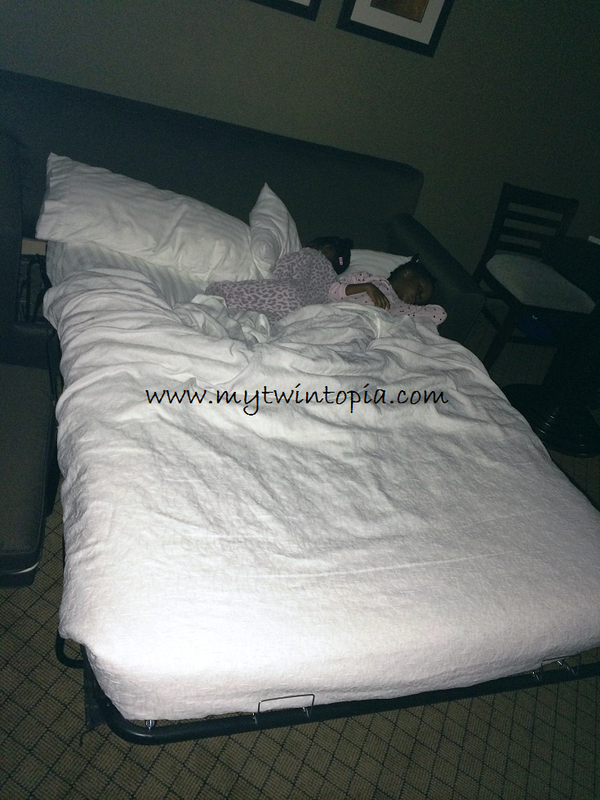 This April, I'm participating in 2 blog challenges and want to use that as motivation to write not about my twins but for my twins. 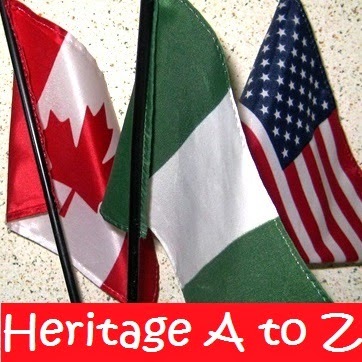 They have a unique heritage of being born in the US to Nigerian parents and then growing up in Canada. There's at least 3 major cultures that they have to straddle and this is number 4 of the 26 things I have to tell my twin girls about who they are and their heritage.